If you need to train new staff or test new settings, such as menu arrangement, discounts, or new items, then your EPoS can be switched to Training Mode. 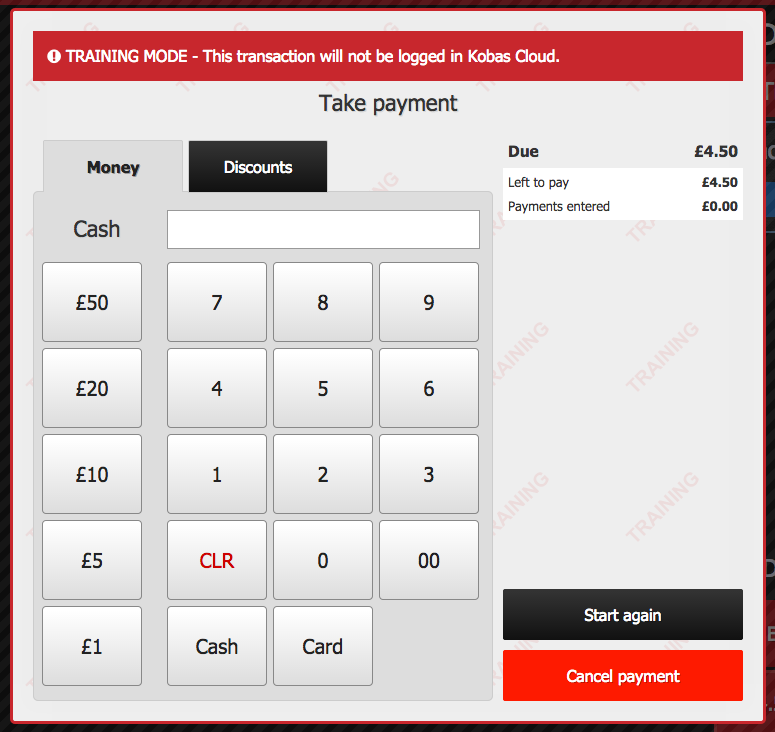 In training mode your EPoS will function as normal, but in such a way that no transactions, staff actions or stock usage etc will be logged in your Kobas account. This means you can put through dummy orders, tabs and refunds etc without skewing your live figures. It also allows you to demonstrate actions like clocking in and out or signing up new loyalty customers without this data being recorded. 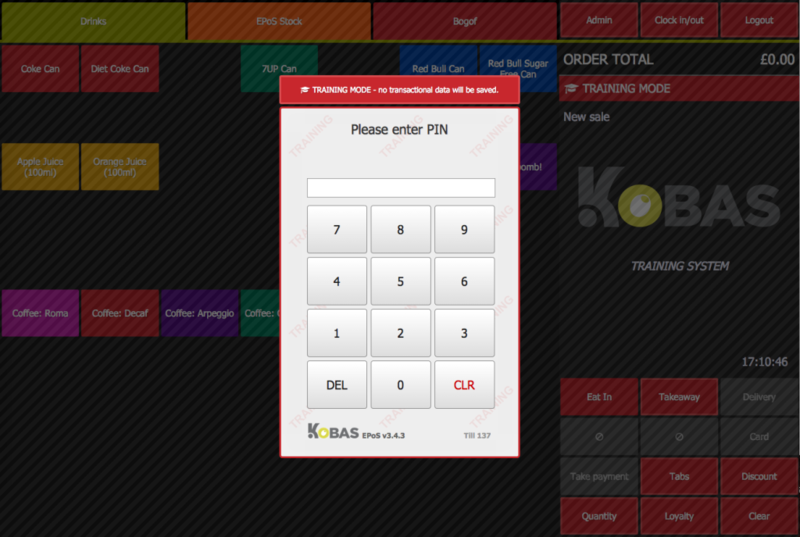 To switch your EPoS in and out of training mode, you must have the permission Access Training Mode And Other Available Venues applied to your Kobas user account. This can be set up in Kobas Cloud, under Staff > Current Staff. On your till, open the Admin menu and touch the Tills menu button. 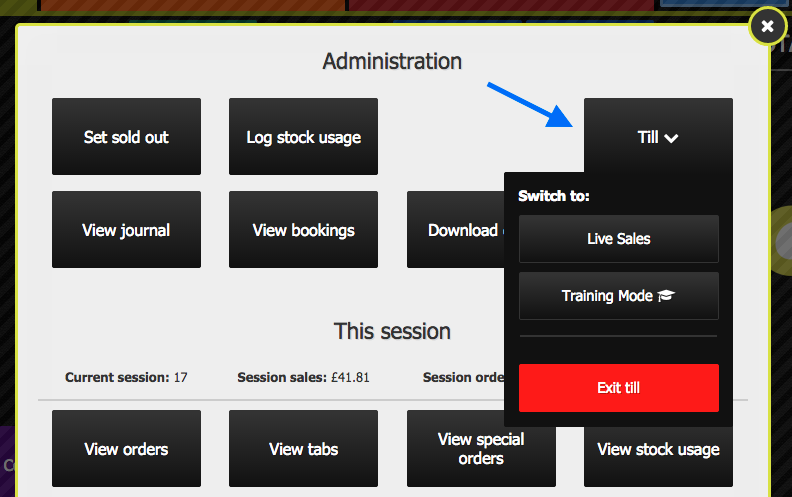 Here you will see the option to move between training and live sales modes. When in training mode, the appearance of your EPoS will change significantly (to avoid accidental use in this mode). The colour scheme will be predominantly red with warnings at payment stages and training labels throughout. This differs from the green and blue colour scheme of live sales mode, that has no mention of training anywhere. Any receipts and work dockets printed while in training mode will clearly state this fact. Downloading EPoS data in training mode is separate to downloading data when in live sales mode. This means you can make menu or discount changes and download just to training mode in order to verify any changes are OK. You would then switch to live sales mode and download data again to get those changes live for all your venue staff to use.